This week, Google announced they’ll be pulling the plug on the consumer-facing Google+, although after unreported widening abandonment. Google’s social network rocket never quite left orbit and was already on its way down. Although the decision was partly portrayed as protecting user’s privacy, recently a substantial number of Google+ users had already abandoned the platform. In the last year, a substantial number of Google+ users stopped returning. This is based on the results of our independent survey, TUP (Technology User Profile), conducted continuously since 1983. From mid-2014 through mid-2017, Google+ had continued its steady, but stagnant, usage patterns. During that time, the number of active US adult users hovered between 41.7 and 48.6 million. 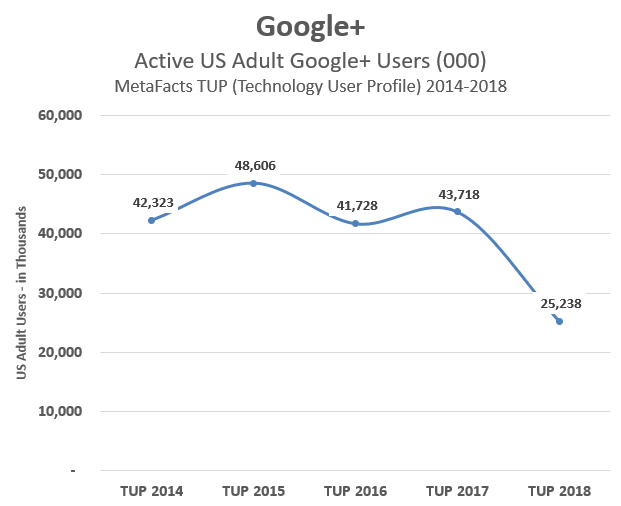 Even before Google announced the closure of Google+, we found in our most recent wave of TUP, fielded mid-year 2018, that the number of Google+ users had dropped nearly in half, to 25.2 million users. The final Google+ hangers-on form a unique profile, especially for the sites they frequent. They are three times more likely than the average online adult to be active on MySpace, and twice as likely to be using Viber, Reddit, Imgur, or Tumblr. Demographically, usage levels plummeted simultaneously for all age and gender groups. At one peak point in 2015, 43% of online males age 25 to 34 were using Google+. By 2018, that plummeted to 14%. Remaining users are not from any particular gender or age group, as all have penetration rates in the teens. Even though Google’s announcement hinted they may refocus Google+ on enterprise users, these are also few in number. In fact, a higher-than-average share of remaining Google+ users are unemployed or employed part-time. Google’s sunsetting may discourage the remaining loyalists, affecting use of other Google products and services. For example, Google+ users are twice as likely as any other online American to be using Google Nexus Player, and Google Chromecast. And, in China and India, Google+ adult users have an above average share of using Google TV and Google Nexus Player. Furthermore, in India, Google+ users actively use an average of 1.64 Google devices, including Smartphones and Tablets. If the transition is managed well, Google’s attempt to reverse the polarity of a negative to a positive may avoid inadvertently changing Google+ to Google minus. This post includes a complimentary brief summary of recent MetaFacts TUP (Technology User Profile) research results. These results are based on results of the MetaFacts Technology User Profile survey, from TUP 2018, its 36th consecutive wave, as well as previous waves. Comparable results are available through TUP fielded in Europe and Asia. For more information about MetaFacts and subscribing to TUP, please contact MetaFacts.